I am making my daughters wedding cake, and I will be making the cakes a month prior to the event, splitting them in two and freezing them. Three days before the wedding I intend to de-frost them, fill them, and cover with a thin butter-cream frosting. This will be two days before the wedding; can I at this stage put them in the fridge? I intend to cover them with fondant icing the day before the wedding. Great question! The answer is yes! Just wrap them in plastic wrap for extra protection from odors. Also may I suggest that you fill them after baking and cooling, crumb coat, wrap well in plastic and then freeze them. It's a whole lot easier that way. When you defrost a cake all the way and try to work with it it is soft and difficult to work with. Hi Lorelie, thanks for your helpful reply. Do you mean I can freeze the filled cakes even with a buttercream filling or a cream cheese filling? One of the layers will be lemon sponge, and I am using a lemon buttercream filling in this. I will be using a orange flavoured cream cheese filling for a carrot cake and stem ginger syrup cream cheese filling in a ginger layer. What do you think? I have never done anything like this before, although I have had a few trial runs with the recipes, and they seem to be working out okay. I will be a nervous wreck when it actually comes to finishing them off. Yes I freeze filled cakes all the time with both butter cream and cream cheese icings. I know it's scary doing a wedding cake for the first time, I have been there. It was terrifying. Its like a performance and you want to make sure it gets rave reviews! But you can do this if you take it slow and in steps. What is the date? I would love to see a photo of it. Hi great site! I too am doing my daughter's wedding cake and I have some wedding cake frosting questions. I have already baked and frozen all the cakes. I have 8 cakes which I will double up for the 4 layers. My question is - the cakes are already frozen with no frosting, when should I crumb coat them? #3 apply the fondant icing and finish decorating with gum paste flowers, already made, the same day? Or do I need to wait till the fondant sets up and if so how long? I know this will be 2 whole days before the wedding which is Saturday... I worry I am doing it too soon..or not in the correct steps. Please help the wedding is in 3 weeks! 17 July thanks for all your responses! Answer: Yes you are correct the first coat is the crumb coat. You do not have to thaw the cakes out to crumb coat them. In fact I almost always crumb coat frozen or very chilled cakes. After the crumb coat you can go right ahead and finish coat them with a thicker layer of butter cream. You can then store them in the refrigerator, not refreeze them. You want them to be manageable but not so cold that the fondant sweats when you apply it. Once the fondant goes on you do not want to refrigerate it so it is best to wait until the last possible time to do it. Thursday may be fine as long as you do not have a filling that can spoil. Butter cream is the safest filling to use. I am planning on doing this myself in August with a square fondant wedding cake. And I will have to put the Fondant on the cake on Thursday and deliver the cake on Saturday. The cake must be kept in a cool place. So I use the basement or an air conditioned room. I then cover the cake in plastic to protect it from dust etc. You can decorate it too on Thursday with your gum paste or fondant flowers. I hope this helps. And please send me a photo when you are done. You can upload it with the same form you used to write this post. My readers and I would love to see it. 1. bake, cool, cut layers (for filling), crumb icing. 2. Once the cakes are crumb iced, wrap with saran plastic wrap & freeze them. 3. Thursday 9/23/10 I will take out frozen cakes for the 1st cake, fill, layer, & second icing . I will continue with same step for the 2nd cake. After this step, I don't know what to do because once I fill and ice all the cakes, do I leave them out? I want to decorate on Friday so I'm not stressed out at the last minute. In the meantime, I will be making fondant flowers and decorations. The first cake is going to be a 3 tier princess cake for a 1 year old baby. The filling will be buttercream icing. The second cake is going to be a 3 tier Salsa theme cake. Each layer will be filled with different flavors. Chocoate mousse, strawberry, and lemon. I'm doing this out of my condo with 1 refrigerator and a small freezer in the garage. I'm looking forward to your reply. Your the best! I baked and decorated a cake yesterday (Wednesday) for a wedding on Saturday. The cake is decorated with buttercream icing and has no filling. I kept it in the refrigerator last night, but took it out this morning (Thursday) for fear it would dry out. I cannot cover it. How is the best way to keep it until Saturday? Help! Anonymous-Your cakes will be fine in the fridge until Saturday. The buttercream will keep them from drying out. If you want to you can cover them with plastic wrap for extra protection. Good luck and please submit a picture of the finished cake. 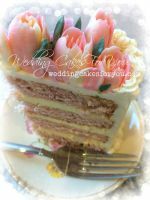 You can enter it in the cake deco competition if you like or add it to the wedding cake stories page or the cake pictures page. The links are in the right column. Sa'Ga I apologize for not replying sooner. Somehow your post was overlooked, and I am seeing it for the first time tonight. I hope your cakes came out good. You had it all right and to answer your question- after filling and frosting your cakes you can store them in the fridge until you are ready to deliver them covered or not with saran wrap. The icing will seal in the moisture. You can then cover with fondant. Box up your fondant cakes to seal out the moisture in the fridge and your fondant should be ok. Save the delicate decorations to last minute if possible especially if there are colors in the fondant. the colors will drip in the fridge. Glad the comments helped. Good luck tomorrow with your wedding cake. 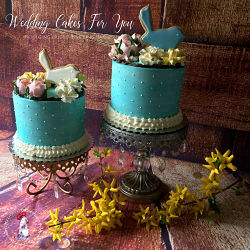 Take some nice photos of it and you can enter it into the contest or wedding cake pictures page. It went so well thank you! Bride was super happy, delivery was fine it was 4 tier but just the top one was real cake, I still made my own fondant and decorated it all but is that still fair for the contest or does it all need to be real cake layers? I think that would be ok as long as you gave some kind of how you did it story. There are probably a lot of people who would like to know how to work with a dummy cake. Make sure that the story is at least 300 words ok? longer is even better with lots of details. Thanks Linds. I baked two 9' & 6' cakes tonight and plan to wrap in saran wrap and refrigerate tonight and tomorrow after Thanksgiving dinner w/hubbys family come home and make the icing and try my hand. What do you mean by crumb coat? Is that a light icing to catch the loose crumbs? What is the best way to do this? Congratulations on your daughter's engagement. Yes a crumb coat is a way to seal in the crumbs so that your final coat goes on easier. Once your cakes are filled you put your buttercream on and coat the entire cake. The coating does not have to look great, it is an undercoat, so don't fuss over it. Put it back in the fridge to harden up a little bit. Then your final coat goes on. I sometimes rough up the sides with an icing comb before doing the finishing. You can also use a warmed up glaze of apricot jelly or other flavored jelly to do the same thing. I prefer the buttercream as it covers the cake more effectively. Good luck and feel free to ask more questions as you go. 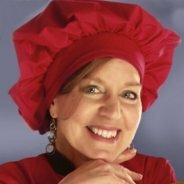 Please add your cake to the site anytime along with any tips you pick up along the way, a favorite recipe that you used or any type of story that would be helpful or interesting to visitors. We would love to see and hear about your cake and the wedding. Hi I would bake the cakes if possible during the week, wrap and freeze. Fill and crumb coat wrap and refrigerate or freeze. Get all of your decorating supplies in order and spend the weekend decorating. If you can do it in steps like this it will not be overwhelming. Sounds like a big project for a first time cake, so give yourself lots of time. If you start to feel overwhelmed, take a break and clean up the work area a little before going back to work on it. Good luck and please update us ok? I have made a huge sponge cake for a Christening, filled itwith jam & buttercream ready to cover with fondant today and the Christening has been cancelled as the children have all caught chicken pox!! Can it be frozen? I have frozen sponge cakes before but not once they have been filled so not sure? Hi Tina, Yes you can freeze your cake with the jam and buttercream frosting filling. Wrap it very well in layers of plastic wrap first and it will be fine. No problem I freeze cakes with fillings and crumb coating all the time. All the comments on here have been very helpful, but I just want to check a couple of details when it come to freezing the cakes. I can fill the cake and crumb coat it and then freeze it?? Then it doesn't have to be fully defrosted in or for me to fondant ice it?? I'm guessing as long as it's defrosted and still chilled in the fridge this is ok and it won't sweat and become soggy? Hi Sammy, Your cake will be fine if you defrost it in the refrigerator and then frost and fondant it. I'm making a birthday cake that is due on a Tuesday. It would be easier on me if the cakes were made and I could just decorate on Tuesday. So my question is after the cake cools, do I then fill in the layer with buttercream, crumb coat, freeze to get the icing hard, then wrap. Or do I crumb coat and immediately wrap and freeze. Also after I get the frozen cake out of the freezer do I unwrap then defrost in the refrigerator ? I'm decorating the cake with piped buttercream. Hi Keisha, Either way would be fine. I usually fill and crumb coat then freeze. I ice the cakes frozen or semi frozen, You may be more comfortable defrosting your cakes first. I've been decorating cakes just for my children and family for the past 5 years. I will be doing a baby shower cake for my sister-in-law in June. I found a design on the Wilton website that is a 15x18 sheet cake base with a character pan placed on top. I have not done a tier cake before and one, am planning on doing a practice cake first, but am wondering about the mechanics of how to place the character cake on top. I assume that I need to have some type of support structure to hold the top cake on without it damaging the bottom layer? Also, if I bake the cakes within a week of decorating, will they be fine in the refrigerator with or without a crumb coating? I can crumb coat the sheet cake, but not the character pan because I don't want to lose the details that will be imprinted onto the cake. Hi Jill, You will want to put your character cake on a piece of cardboard that has been cut to fit the shape of the cake. To support the weight of the top tier, use either straws (regular drinking straws) or wooden dowels (Wilton sells them) Cut your dowels to the height of the bottom sheet cake and insert them into the cake. Sprinkle a small amount of coconut or graham cracker crumbs onto the surface of the bottom tier before placing your character cake. This will help to prevent the buttercream from sticking to the cardboard. Once your second tier is placed, put a dowel (wooden one for this)through the two cakes to hold them in place. I'm planning a party for my daughter. I have tons of things to bake and prepare 1,2,& 3 days before the big day. If i bake, fill (whipp cream & fresh strawberries) and decorate with icing a week in advance, can i store the entire cake (covered) in the fridge? I have young kids and time doesn't play well with me, so i definitely need to spread out things and it'll help if I'm able to finish things early. Hi If you use a stabilized whipped cream your cake may be ok. But a week is probably pushing it and the strawberries may get a little mushy. Can you use a buttercream instead? If not try one of these whipped cream recipes. Any one else who wants to add a bit feel free. I have made several character cakes for my kids over the past 17 years. This will be my most difficult. He wants a 3 tier cake basic buttercream icing filling (maybe flavored) and buttercream icing outside. I will be refrigerating the cake after dirty icing it. When is the best time to take out and finalize the outer layer of icing and add the decorations (Fondant medals)? I plan to put the cake together at the facility on Friday and would like to have the icing on it so when I put the cakes together on Saturday it is done. Do I need to let the cake sit out so when I put the fondant medals on it they don't slide off? Or should I go ahead and "build" the cake, refrigerate overnite, then pull cake out early to get to room temp. and then add the medals? Ceremony is Saturday, June 30th. Hi Traci, Your fondant medals can be placed on the cold buttercream cake after you set it up at the venue. You can use a tiny bit of room temp buttercream to help it to stick if they need some help staying put. Good luck. I want to know how long I should cool my cake before I remove it from the pan. If I am presented it the same day, should I crumb frost it and freeze it so it is easier to work with? Thank you. Hi Patrica, Cool your cakes for about 20-30 minutes, enough so that you can handle the pans. Run a knife around the edges, place a cardboard round or cooling rack on the top of the pan and flip it over. Your cakes should slide out. Yes on the filling, crumb coating and freezing. I'm making 2 gender reveal cakes for my friend who's having twins. It's now Thurs. night and the party is tomorrow evening. I did 2 (pink!) 4-tiered cakes and have done the crumb coats and a thicker layer of buttercream icing. The cakes are now wrapped in saran wrap and are in the fridge. I'm going to do fondant circles as well as a fondant bow on top, and I'm wondering if I can I do the fondant tonight and leave the cake sit out over night and all day tomorrow until the party (5:00)? Hope to hear from you, and thank you for the great information on your site! Hi Jenny, I just got this on Friday morning. I hope it's not too late. If you have not added the decorations yet, I would hold off as long as possible, because it sounds like you are putting colored fondant decorations on a buttercream cake. The moisture from the buttercream will soften the fondant and colors may run. If the cakes were all covered in fondant I would more likely say yes. Good luck. Please let me know what you did and how everything goes. I am curious to find out. Hi Kim, A strawberry jam would be good or even better (safer) a strawberry buttercream) Just add the jam or preservers to the buttercream and mix well. The buttercream will act as a glue to hold the layers together. Keep the cake in a cool spot (the basement works well)or an air conditioned room. 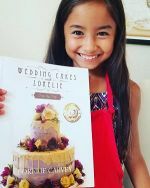 Get a box at a mailing store, or call UPS and see if you can get a box from them, It will need to be the exact size of the bottom plate that the cake is on, or if it is slightly bigger use a hot glue gun or double sided tape to hold the plate from sliding. You can deliver without a box, but your precious cargo will be much safer in one. It needs to be on a flat surface as well during transport. I have been known to build up the front seat of my Honda with pillows and place a flat board on it. I then put the box on top of the flat board and put pillows all around the box to make sure it does not move. A van is ideal for this or a station wagon, If the cake is not too large a trunk will work. So glad I found this page first Google! I've baked 2 different square cakes for my husband's 50th, that are presently frozen in my M-i-L's spare freezer. It struck me only half an hour ago - oh ohhh - i forgot about the crumb coating, when do I do it! So glad to know I can crumb/butter cream before it's fully defrosted because I need to level and shape the two cakes to create an even long flat slab cake (I'm not filling the rotters coz I can NEVER get the cut even, even using some tips on a round cake a pastry chef showed me!) I need to do the levelling before they defrost too far to make it easier as well as lift them onto cake tray's to make sure their botties don't get damp. The cakes will then go into my M-i-L's fridge ready for the fondant and the decorating. My only real problem is.....when to stop playing with the gum-paste deco's!...and of course, placement of the decorations since my first idea failed (so far). Need to find a very basic font to use as a template for the 50. Such Fabulous site. Hello. Im so sorry I just am seeing this post. This post has gotten so long. I imagine you already finished your cake. I hope all went well. It looks like you found your answers here and I am VERY happy that this site helped. If you have any more questions contact me throught the contact page. Thanks so much. If I can still be of help I would love to hear from you. This is wonderful....what you have done here. Your website is great! I stumbled across it and can't tell you how much I've learned and thoroughly enjoyed everything. I'm no baker but plan to make our cakes for our 50th wedding anniversary in January. I think you have given me the confidence to pull it off. Sounds like you have helped many people and I just want to say Thank You! Thank you so much May. That is wonderful!Please add your cake to the site when it is finished so we can all see it and read about it. Happy Baking and Decorating! I have to make a wedding cake by a Wednesday to be picked up on Thursday and then to be driven to the wedding 9 hours away the next day and then the wedding isnt for 3 more days. Needless to say, I am not going. Is there any way to do this and the cake will be fresh? They do not like fondant. I am out of ideas at this point. Hi Jenn, The trip will be the most challenging. Your cake will remain fresh for a few days. There are several posts on this website about this subject. Here is a one of them! And another one about the boxing of the cake with photos. Lorelei, Thank you for that information. I am actually pretty ok with the transporting because it is not a layered or filled cake. We are going to box them separately and then using a foam piece, cut out squares for the boxes to sit in and the whole cake will lay flat in the back of the Suburban and wont move with the foam barrier. But I am being told by people that the cake will not taste or be as good because it is not going to be refrigerated for 2 days and then in the fridge for 2 days and then out on the day of the wedding. Because the couple doesn't want the fondant, which would protect the cake, the buttercream will pull any moisture from the cake in my experience after a few days (2-3). I have thought about the sugar spray before I do the crumb coating but I am not sure even that will work after a couple days of in and out of the fridge and I have never done that before so it makes me nervous. Also, with it being buttercream, once it is removed from the fridge and has a chance to get warm again, will any colors run that are on the frosting? Okay. My sister volunteered my services to make a wedding cake that feeds 175 people. I have only made one wedding cake before and it was for a very casual family wedding. I need help. I plan to make a four tier square cake. Do I need to support each layer with a plate or cardbord? Or can I just stack the layers directly on the lower layer using dowels or straws? Also, I tried my hand at making fondant for the first time today. It wasn't hard and tastes a lot better than the store bought fondant. Since this was my first time, I made the fondant way early in anticipation of possible problems. The wedding is not until September 22, 2012. Should I refrigerate the fondant, or just leave it rooom temperature in a sealed container? for two weeks? Hi Darlene, You will definitely have to put either cardboard or cake plates under each tier. Have you seen my new ebook? It will take you through every step. And yes to the dowels. In your case with a cake this large you should probably use wooden ones. Congrats on the fondant making. Wrap it very well and then put it in a sealed container or it will dry out. You don't need to refrigerate it. If it does harden a little microwave it for a few seconds until it softens up and then knead it and roll out. Good luck. Would love to see it when it is done. Hi Jenn, I think maybe a nice flavored syrup on the cake layers would help immensely. Doesn't sound like you have much choice. Have you considered the dry ice? This will keep the cakes very cold. You can put a small amount in each box. Colored fondant pieces over buttercream are a problem however. I have had colors leaking in situations like this. Is there a way to hold of on the decorating until right before the event? Putting dowels in frozen cake? Hi there. I am making my daughter's wedding cake, and I have filled and crumb coated the four layers following your recommendations. My question is when to insert the dowels. We are planning on icing and decorating the cake on Thursday for a Saturday wedding, and assembling on site. I thought I would keep it frozen until Friday, but realized that we still need to put in the dowels. I have purchased wooden ones because of the size of the cake. Does the cake need to be defrosted completely before I insert the dowels? Thanks for a great site, it has made the whole process a lot less intimidating. Hi LG, I would recommend removing the cakes from the freezer and letting the cakes get to the temperature of the refrigerator. If the cake is still semi frozen inside than you can use a sharp tool similar to the size of the dowel to make a hole for the dowels to slip into. I sometimes have to use a metal skewer for this purpose. I have an ebook for purchse now that has the entire process from start to finish. Here is the link to that book. Hi, i love your website! I'm so nervous this week, because i have to do some cakes and the due date is next week. I'm going to make 3D horse for next sunday, my questions is can i start baking tomorrow and then filling and then carving and then wrap them with saran and keep them in the freeze and i'll cover it with fondant on Friday? Hi Fita, yes you can bake that ahead of time carve fill freeze and then remove from the freezer for at least a few hours before putting your fondant on. Good luck with your 3d horse cake. I would love to see this cake if possible. Please share it when it is done. Hi, I'm making a 3 layer vanilla sponge, filling it with jam and vanilla buttercream for my parents birthday. I am going to cover it with regal icing, so when I've crumb coated it, can I cover the cake with buttercream and then place the regal icing straight on? Will the buttercream work as a glue? I am working on my grandparents 60th anniversary cake. The cake is frosted and in the freezer. What I want to know is if it is ok to put the dried gum paste flowers on the cake and freeze it? 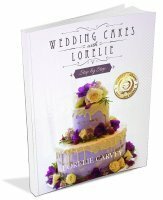 Hi Kari, I would not put the gumpaste flowers on the cake while it is in the freezer or the refrigerator. They will absorb moisture and get soft again. Hi Kelly, I think i know what you mean. You want to make a pattern on it with a sheet that makes an imprint? If so I'm not really sure. The best advice I can give to you is to try it out and see. Let me know if I am correct in what I am thinking your idea is and I will ask my facebook followers if they know the answer. Hi There, I am going to make a 3 or 4 tier wedding cake for my son later this year. I am confident making a variety of cakes but have never made and stacked a celebration cake like this. I will have to transport the cake 400 miles to Scotland ( a 9 hour journey) 3 days before the wedding!!! If i make a variety of fruit, carrot, sponge and chocolate recipes and cover them with fondant 4 days before the wedding, will they still be fresh???!!! I intend to decorate simply with flowers between the tiers and ribbon, all of which I will have to do the morning of the wedding. All of these would be fine to use. The filling is another story. You should use either a flavored buttercream or a chocolate ganache. Both will fare well on a long journey. Cover the cakes with the fondant and than wrap in plastic wrap and box them. Store in a cool spot (not the refrigerator) and your cakes should be fine. Hi, I baked a cake last night being Tuesday and it's hot for the next 4 days, should I put the cake in the fridge or can I leave it out. I need to put fondant on Saturday for Sunday. Thanks anyone that can help. Hi, wrap the cakes really well and freeze them. This is the best possible way to keep them fresh. You could opt to refrigerate them too. I wouldn't leave them out in hot weather. (If Frozen)Remove them from the freezer and place them in the fridge for a night to thaw fill frost and fondant. Thanks Bobby and You are quite welcome :-) Enjoy!!! My favorite person who does cakes is going on vacation for a week and won't be back until the night before my daughter's birthday. The cake would be white cake with almond flavoring and buttercream frosting. Would it be worth seeing if she could make it the week before she leaves and freeze it in my deep freezer? Would it still be fresh? It will be a two or three tier cake. It might have a fruit filing if you think it would stay fresh too. Put another way, how long do you think a fully decorated buttercream frosting cake would last in a freezer? Hi everyone, has anyone used the stacking systems that i have seen advertised. I would be pleased to hear some reviews as they look very secure. Hi about the fondant cake staying fresh. Your cake should be fine for Sat. Make sure it is covered well though with plastic wrap and boxed. Your fondant may end up getting a little sticky and shiny. Remove it from the fridge on the morning of the celebration and let it air dry. And in reference to the Cake Stackers.I love them and use them here is a link to my review and testimonials from visitors to this site who have purchased and used them. Buttercream on a cake in advance??? I'm making a cake for a birthday party on Friday night, and am covering it with buttercream, but I am at work all day on Friday, and the party is at 6 o'clock-aahhh! Can I cover the cake in buttercream the night before? Will the buttercream be ok overnight? Should I store the cake in the fridge? Some help would be very much appreciated! Hi, I love your site. I'm hosting what was supposed to be a small 6th birthday party for my daughter that turned into a large cake decorating party. 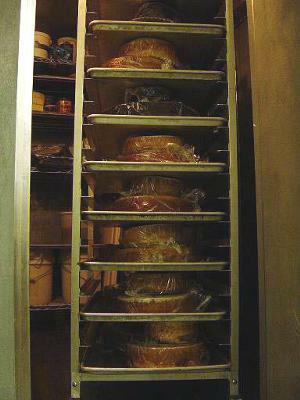 I baked 24 square cakes today, wrapped in Saran and now in freezer. The party is Friday at noon. I'm freaking out. I don't think I will have enough time Friday morning to frost all the cakes. What do you recommend? I made two batches of your Italian meringue buttercream frosting. If Thursday night I take out the frozen cakes, layer them (I'm doing two cakes with buttercream in middle to create more area for girls to decorate) crumb coat them, can I final frost them thurs night as well and leave in fridge? Will saran wrap ruin frosting? Or Saran wrap again and freeze again? Party is at noon on Friday. Also do you have video for crumb coating? I'm having nightmares of doing it wrong. Hi Here is a video of filling and crumb coating. It's a wedding cake but the same applies for a regular cake. Can you fit all of these cakes in your fridge? I imagine them being small. Fill and crumb coat as in the video, then wrap and freeze them. Finish them on Thursday evening or in the morning (early)on Friday if you must. You don't need to wrap them after you put the final coat on. Then let them thaw in the fridge. Hope that helps. Its very ambitious project. Have fun and let me know how it goes. I would LOVE to hear all about it. Oh and would love to see a photo of the party. The girls will have a blast. Thank you so much for the video and advice. I have two freezers and refrigerators to work with. I'm going to fill and crumb coat tonight then Saran and re freeze. Can I take back out after an hour and put final coat on then place in fridge overnight uncovered? Party will be less than 20 hours from time of final frosting??? I'd rather have time to set up decor than rushing frosting the cakes. Where can I email you pictures? I would love to share! Hi You are welcome and yes you can put the cakes in the fridge instead of the freezer after crumb coating if you prefer and then frost an hour later. That will be fine. I think you have a little future pastry chef in the family? Help!!! I took out my Italian buttercream to let set to room temperature so I could crumb layer all my cakes. I let the buttercream set for an hour, started to whip it and there is a bunch of liquid in middle and bottom of bowl , do I have to throw it out or can I salvage it??? I'm so bummed! Do you cover a cake while it is crusting? Can I freeze the cake after the chocolate mousse filling is put in the center of two layers, before the final buttercream coat? Hi To answer all three questions above. If your buttercream separates, try heating it slightly in the microwave and the re-whipping. Uusually this will bring it all back together. Try adding some confectioners sugar to it as well. Yes you can cover your cakes while they are crusting. (I don't use a crusting buttercream) but I think it should not make a difference. Yes you can freeze a layer cake with chocolate mousse in the center. This, I do a lot. Hi, I don't normally recommend refrigerating a fondant cake. But in this case as long as you cover your fondant cake with plastic wrap (lightly covered) and box it up as airtight as possible, then yes you can refrigerate it. The problems arise when the cake is exposed to moisture in the refrigerator and or if the cake is very cold and suddenly is exposed to warm temperatures. This can cause moisture to bead up on the fondant and make it shiny and sometimes a little gooey. 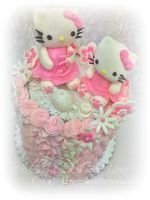 As long as you do not have colored fondant decorations on the cake (such as polka dots stuck to the sides of it or lots of colored fondant flowers) then you won't have to worry about colors running. Good luck. Please let me know how it turns out. Hi Patricia Ann, I have filled cakes with buttercream and applied fondant on them a day or two in advance and have not had a problem. If the filling was a custard or something like that I would worry. Buttercream will not melt enough to be absorbed into the cake. Once your cake is finished, box it and place it in the coolest place you can find in the house. The basement perhaps? Hope that helps. Hi, The cakes that have been buttercreamed are probably ok, the ones that were not, are probably not ok. These may be dry and also may have absorbed odors from the freezer. The buttercreamed ones will be moist still but there is a chance that the icing they will have that freezer taste as well. The only to way to know is by tasting. So if you can take a little scraping of both and sample them now and then determine whether to re-bake or not. From Lorelie, Good luck, the satin ice is wonderful. I am baking a 50th bday cake. I'm using two different size cake pans and stacking. I cannot decorate until the next day. I know I should crumb layer it. But should i freeze or refrigerate until the next day? And should i wait till the next day to crumb and decorate it? I am no expert by any means but when I made my first (and only so far) wedding cake I learned a few things. I think you should crumb coat (and fill if you are filling) and freeze overnight. This will make the cake layers easier to handle and decorate. They will thaw nicely before the time to cut and eat. Thank you for a great question and a perfect answer as well. I love that my visitors help each other out. :-) Good luck with your 50th birthday creation. I see a lot of questions regarding freezing cakes. I am doing my first wedding, however I am doing cupcakes instead of cake. Can I make the cupcakes ahead of time and freeze them? How would I wrap them to prevent them from drying out? I will be doing Whipped Cream- Cream Cheese frosting and Vanilla Buttercream frosting. Can I pipe this on to the cupcakes before freezing, or wait until they defrost? How long do they take to defrost? Hi , Yes you can freeze cupcakes. They don't take long to defrost at all, maybe 20 minutes? IDEALLY-(I did it this way recently) If you have a lot of cupcake tins, leave the cupcakes in the tins and wrap the pans, freeze them and then you can stack them on top of each other in the freezer. The day of the wedding, load them up (still wrapped & I literally waited until the last minute to load up the car) remove them one at a time at the venue, pipe on frosting and put on to the stands or display. I found this to work best for the cupcakes to look their best. If you frost and box and then deliver the cupcakes, it can get real messy. Unless you have special carriers, I would recommend trying it like this. If you do not have a lot of tins, then remove them and wrap each one individually and freeze. Hi There! I baked a 6 layer cake on Tuesday morning. Placed each wrapped layer in the freezer for several hours. I did a nice crumb coat Tuesday night. I plan to cover the cake in fondant. The party is on Saturday. I'd like to cover in fondant Friday morning. My question is what's the best thing to do w my crumb coated cake now from Tuesday night until Friday? And can I leave my fondant cake at air conditioned room temperature overnight Friday to Saturday? Thank you!!! Hi Wrap your crumb coated cakes well and freeze them. This will keep them fresh. Take them out of the freezer the day before you want to place the fondant. Store the cakes in fridge. Fondant them and then yes you can leave them out boxed and in a cool spot. I have been asked to make a cake for a cake walk at a fundraiser. What is the best kind of cake to make for an event like this...do I go all out or go simple?!? hi, I'm making my daughters first birthday cake, I made the sponge yesterday and I'm going to fill it with jam and buttercream the cover it with icing, ready to decorate tomorrow evening for Tuesday, how long will this keep and is this ok? Am designing a cake with butter icing for my nieces birthday . How do I prevent the butter cream from melting? can I put it in the refrigerator without denting my Designs? I am making a 2 teir Butter cream and fondant decorated cake for my nieces bday next weekend. I plan on making my fondant decorations on Thursday night and storing them. I am baking the cakes on Friday night, frosting and decorating. My question is should I store the finished cake in the fridge over night or leave out? Also, I want the fondant decorations to be soft and edible not hard. I am transporting the cake 30 mins away on Saturday. I am delivering it a few hours before the party. Once arrived, should it be refrigerated until we cut it about 4hrs later or leave it out? I don't want the flat colors to bleed or then to fall off. This is my first time making this kind of cake and I don't want to ruin my nieces 2nd Bday with the cake falling apart. Hi Jenny, If the cake has a buttercream on the outside then you can refrigerate it, but not with the fondant decorations on it. Wait until you arrive at the party and add the decorations. My experience is that the fondant will start to get a little soggy and it could bleed into the buttercream. You can leave the cake out once you arrive at the party. The cake will be at the perfect temperature by the time you cut it. Keep the fondant decos in the closed container and they should be fine. Fondant will stay somewhat soft but gumpaste will harden quickly. I really don't know about the image cakes. I will see if I can find out for you. I imagine the wafer paper will eventually break down? Sorry I have no experience with the image cakes. Hello, please I have a cake that needs to be covered in fondant. Should I crumb coat, refrigerate and then cover with fondant once it's well chilled? My fear is will my fondant stick on a frozen buttercream coat? That is one way to do it o'cakes. But you can also crumb coat and immediately apply the fondant. If you are concerned about the fondant sticking to cold buttercream you can always leave the cake out to come to room temperature before applying or you can very lightly spray it with a mist of water. As you work on the cake it will warm up and the fondant will stick. Hope that helps. I am a novice when it comes to icing cakes so please any help you can give me will be much appreciated. 1. Once I have crumb coated the cake and allowed it to harden How do I stick the fondant icing squares to the crumb coat as it will be dry. 2. Can I make the fondant icing squares and figurines in advance and how should I store them.....bearing in mind I will be making many, many small different coloured squares. 3. I will be slicing the 2 cakes to make 4 layers and want to fill them with orange flavour butter cream, as well as crumb coating with the same flavour; please can you tell me the approx. quantities of each ingredient I would need to make enough butter icing. 4. Any other tips you can give re best methods to a successful iced cake. Sorry for asking so many questions, but your help would be very much appreciated. Thank you. Q:Once I have crumb coated the cake and allowed it to harden How do I stick the fondant icing squares to the crumb coat as it will be dry. A:You can spray a light mist of water onto the crumb coating before applying the fondant. Q:Can I make the fondant icing squares and figurines in advance and how should I store them.....bearing in mind I will be making many, many small different coloured squares. A: I would say yes to this. Store them in airtight containers possibly separated by plastic wrap? Q: I will be slicing the 2 cakes to make 4 layers and want to fill them with orange flavour butter cream, as well as crumb coating with the same flavour; please can you tell me the approx. quantities of each ingredient I would need to make enough butter icing. How long will it take buttercream icing to thaw after being in the fridge? A: It takes a few hours. It depends on the temperature of the room as well. You can always put the buttercream in the microwave for a few seconds, stir and repeat until soft and smooth. Hi , Really the page is very usefull.learning from everyone's mistake. I am delivering for the first time ,a 3 tier mickey mouse cake on monday noon . so planning to prepare the cake on saturday and regrigerate it and after finish crum coat then regrigerate again till monady morning . and will cover it with fondant and assemble it for delivery .is this plan work ? also for assembling do u recommend dowels to use ? and aslo i am doing a chocalate cake with butter cream icing. can i soak the cake , or will soaking makes fondant to sag ? Hi, I am making my son's wedding cake, 3 tier lemon sponge with lemon curd. I want to over with buttercream then freeze. You say in other posts this would be fine. What recipe do you use for buttercream as need to get this right and not too sweet! Help! Hi I use IMBC and it's on this website. The page is called wedding cake frosting. use the search bar to find that recipe or the navigation at the top and sides of the pages. Hope that helps. I am getting married on the 4th of May this year, and thinking of making my own wedding cake, because of the budget. Can anyone advise me when I should bake the sponges, can I do them now and freeze them, or should I wait closer to the time and bake and decorate then?